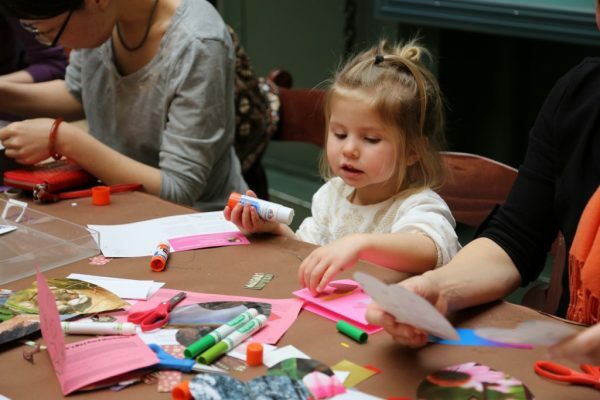 Love is in the air at the Smithsonian National Postal Museum’s annual Valentine’s Day Card Workshop! Perfect for visitors of all ages, this open-house event will be held from 10:00 a.m.-4:00 p.m. on both Saturday, February 10 and Sunday, February 11. The museum provides a bountiful spread of patterned papers, postage and rubber stamps, gems and other 3-D embellishments, special cut-out scissors, washi tape, stickers, markers of every color (with a surplus of red and pink) and more! Once finished, cards can then be placed in envelopes, addressed and adorned with a distinctive National Postal Museum postmark at the museum’s stamp store. In keeping with educating children about the postal service and how mail works, kids can pop their own cards in an official USPS mailbox that is decorated to exactly resemble — none other than — SpongeBob SquarePants! Of course, visitors are also welcome to explore the whole museum and everything else it has to offer. In the modern era, a handmade card can be hard to come by. This event is the perfect environment in which kids can express their love for friends and family with a heartfelt note of affection and appreciation. They can also experience firsthand the satisfaction of crafting their very own unique creations from start to finish, and the pure joy of giving that creation to someone special. The National Postal Museum’s Valentine’s Day Card Workshop is free and requires no advance registration. Visit the museum’s event calendar for information on the many fun and educational programs available at the National Postal Museum.